Profile of the British Boy Band "Take That"
Take That was founded when Gary Barlow, already a veteran of TV performances and in his late teens, met Mark Owen and Robbie Williams, two other aspiring, three years younger, teen performers. They formed the trio Cutest Rush. However, it wasn't long before producer/manager Nigel Martin Smith approached the trio about taking part in a British version of the American New Kids on the Block. The trio agreed and, along with Jason Orange and Howard Donald, they formed Take That in 1990. The group would become one of the most successful boy bands of all time. Take That's first 3 singles in 1991 and 1992 were only minor hits, but they did endear the group to a mostly gay dance club audience that would be a significant part of the group's core fan base throughout their career. The group's cover of the old Tavares disco classic "It Only Takes a Minute" finally brought them a top 10 pop hit. This was followed by 2 more top 10 pop singles and a debut album Take That and Party which reached #5 on the album chart in August, 1992. "We really didn’t plan to get this response especially with the tour, we were a bit nervous about whether tickets would sell. I had my phone off when they went on sale, and then when I turned it on I had all these messages about selling out all the dates in 5 minutes, and would we agree to release more dates. It was just amazing, it really is overwhelming!" Everything Changes, Take That's second studio album, was released in October, 1993, amid fan hysteria for the group. The new collection topped the album chart and included 6 top 10 pop singles in the UK, 4 of them went clear to #1. Everything Changes made Take That into stars in many countries around the world, but US success still proved elusive. With press accolades that Take That were the best-selling British pop group since the Beatles, the 3rd studio album Nobody Else appeared in May, 1995. It included the massive hit single "Back for Good" that finally broke the group into the pop top 10 in the US. Unfortunately, cracks were starting to appear in the group, and there were signs that the taste of British pop audiences was beginning to change and drift away from Take That's brand of dance pop and sweet love songs. All of the following were #1 pop singles in the UK. 1993 - "Relight My Fire"
1995 - "Back for Good"
1996 - "How Deep Is Your Love"
Apparently tiring of the clean-cut boy band image, Robbie Williams began hanging out with the members of pop-rock group Oasis. The group was notorious for drunken and drug-induced partying. By late in 1995, Williams had walked out on the group. The remaining four members soldiered on, but in February, 1996 the announcement came that the group members were going their separate ways. The group's fans were reportedly so distraught at the break-up that British authorities were forced to set up telephone hotlines to make support available to deal with the news. After the group's break-up Robbie Williams went on to become one of the UK's biggest pop stars. Gary Barlow also enjoyed solo success initially. He released 2 #1 pop singles and a #1 album, but by the end of the 1990's his success faded. Mark Owen has managed to generate 3 top 10 pop singles, but the remaining 2 members of the group failed to crack the charts with any solo work. In mid-November 2005 Take That reunited to help put together a documentary on the group including the individual members' views on the group's split and news on what they had been doing for the past 10 years. A new compilation of the band's past recordings titled Never Forget - The Ultimate Collection was released as well and it reached #2 on the album chart. On November 25, 2005 an official press conference was called to announce that all members of Take That except Robbie Williams would be reuniting onstage for a tour in 2006. Called The Ultimate Tour 2006, the group's reunion caused a sensation and necessitated adding 19 additional dates to the initially planned 11 shows. Although Robbie Williams gave his blessing to the reunion and the remaining group members extended an open invitation for him to join them, Robbie Williams only took part in the tour as a 20 ft. hologram during the performance of Barry Manilow's "Could It Be Magic." During the tour the group announced that they would be entering the studio to record their first album in 10 years once the tour was complete. "Patience," the first single from Take That's upcoming album Beautiful World. The song became the group's 9th chart topping single when it reached #1 the final week of November, 2006. The album entered the UK album chart at #1. The group earned four Brit Award nominations including Best British Group, Best British Album, and Best British Single. They won Best British Single for "Shine." Take That proved their return would not be short-lived with "Greatest Day," the first single from their next album The Circus, debuted at #1 in November 2008. The album sold over 400,000 copies in its first week of release in the UK becoming the third highest first sales week in UK chart history. The accompanying concert tour became the fastest selling concert tour of all time selling out 650,000 tickets in less than four and a half hours. In the summer of 2010, Take That member Gary Barlow and his former bandmate Robbie Williams released the duet single "Shame." It was the first time they had worked together in 15 years. The song was a success peaking at #2 and hitting pop charts across Europe. On July 5, 2010, Robbie Williams announced his return to Take That. 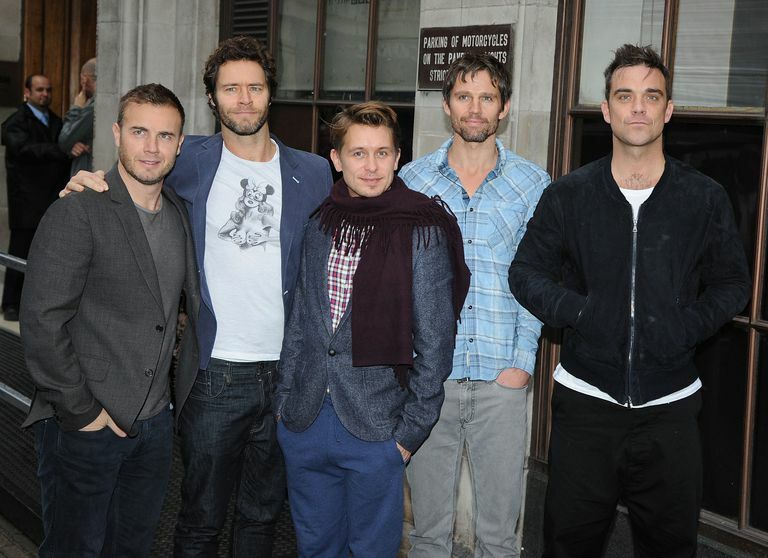 "The Flood," the first single from the fully reunited Take That, peaked at #2 on the charts. The resulting album Progress broke records by selling 235,000 copies in its first day of release. In the full first week of sales, Progress became the second fastest selling album of all time in the UK after Oasis' Be Here Now. Both were eclipsed in 2015 by Adele's worldwide smash 25. The accompanying concert tour sold over 1.1 million tickets in one day breaking Take That's previous record. The group announced that Robbie Williams would perform some of his hit songs as part of the tour. After another Take That hiatus lasting from October 2011 through early 2014, both Robbie Williams and Jason Orange announced their departures from the group. Both were careful to clarify there was no ill will between them and the rest of the group. The resulting trio recorded a seventh album for the group titled simply III. In October 2014, "These Days," the first single from the project debuted at #1 on the UK pop singles chart becoming the group's twelfth chart-topping hit. The album also reached #1.